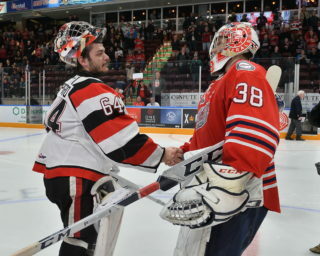 Vancouver Canucks prospect Michael DiPietro emerged victorious in a back-and-forth goaltending duel, making 58 saves over 110 minutes of action as the Ottawa 67’s took a 3-2 triple-overtime win in Sudbury. 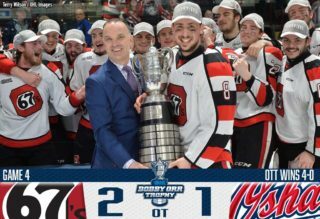 DiPietro backstopped the 67’s to their first Eastern Conference Final appearance since 2012 as they completed a 4-0 second round sweep of the Wolves. The 58 saves are a new career high for DiPietro who improves to 8-0 in the playoffs with a 2.26 goals-against average and .915 save percentage. The 19-year-old from Amherstburg, Ont. 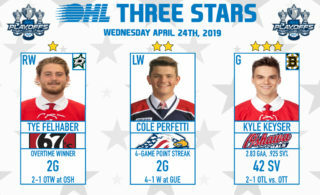 was the OHL Goaltender of the Year in 2017-18. He was Vancouver’s third round pick in the 2017 NHL Draft and made his NHL debut earlier this season. 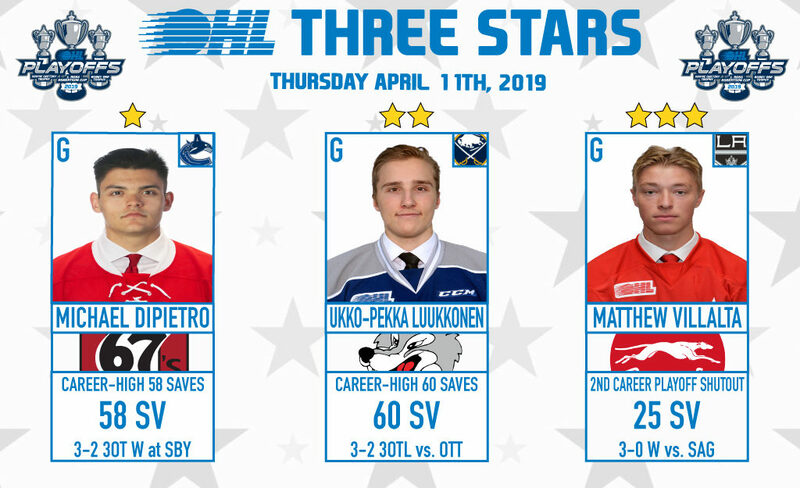 Buffalo Sabres prospect Ukko-Pekka Luukkonen made 60 saves as the Sudbury Wolves came up short in Game 4 of their second round series, seeing their season come to an end in a 3-2 triple-overtime loss to the Ottawa 67’s. Luukkonen kept the Wolves alive until the bitter end when Tye Felhaber scored a power play goal midway through the third overtime. Luukkonen’s 60 saves mark a new season-high as he finishes the postseason with a 4-3 record, a 3.27 goals-against average and a .906 save percentage. The 20-year-old from Espoo, Finland had a year to remember, leading the OHL with 38 wins to go with a 2.50 goals-against average, .920 save percentage and single season franchise record six shutouts. He also won gold with Finland at the IIHF World Junior Hockey Championship. Luukkonen was Buffalo’s second round pick in 2017. 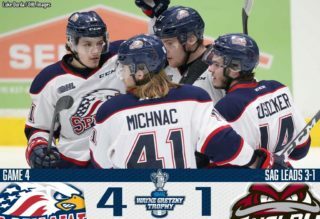 Los Angeles Kings prospect Matthew Villalta completes the Thursday night goaltending trifecta, stopping all 25 shots he faced to keep the Soo Greyhounds alive in their second round series against the Saginaw Spirit. The Hounds took a 3-0 win on home ice to send the series back to Saginaw for Game 5 trailing 3-1. Villalta improves to 5-4 in the 2019 playoffs with his second career postseason shutout. The 19-year-old from Godfrey, Ont. played to a 33-12-5-0 record with a 3.03 goals-against average and .903 save percentage in his third OHL season. He was Los Angeles’ third round pick in 2017.